South London late summer stroll. Click here to see the route (6.4 m/10.2k). Photos/words © urban75, 1st September 2007. 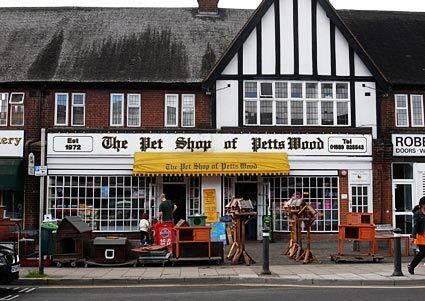 Petts Wood first appeared in records as far back as 1577, when the area was known as "the wood of the Pett family", a local firm of shipbuilders who leased the wood as a source of timbers. 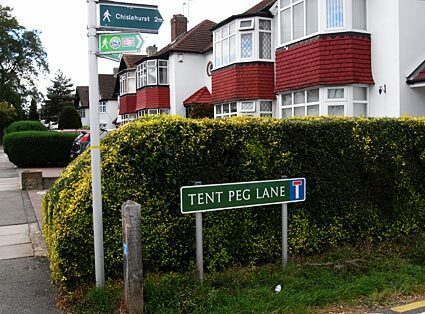 Much of modern Petts Wood was created in the early twentieth century by the developer Basil Scruby who teamed up with Master Builder Noel Rees to create a speculative upmarket housing estate. 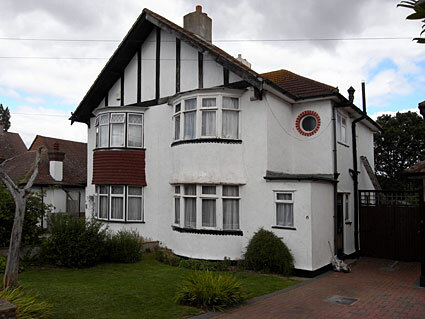 Hailing from Harlow in Essex, Scruby had already proved a successful developer, creating new, low cost estates in towns like Harlow and Peacehaven in Sussex in the 1920s. With its rural setting, fast rail link and proximity to the City, the scheme was a hit, with the original mock Tudor houses still in great demand. Petts Wood took a bit of a pounding in WW2 from Germans bombs because of a nearby important railway junction, while Charles de Gaulle - leader of the Free French and future President of France - risked the bombs by living at 41 Birchwood Road, for part of the war. 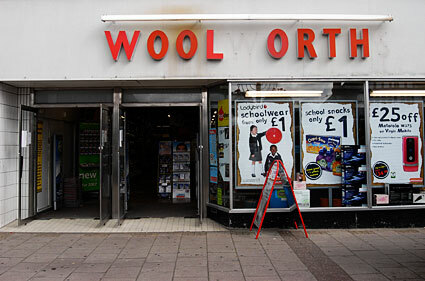 The Orpington train goes direct from Brixton station to Petts Wood, so we were there in under half an hour with no fuss. Which was handy. 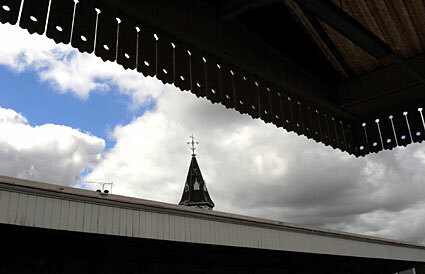 Above the Brixton station canopy can be seen the tower of the Railway Hotel/Brady's. 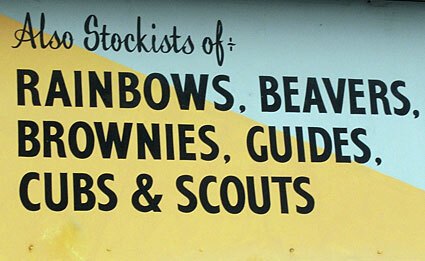 Shop sign on the main shopping street of Queensway, close to the station. Because we care." 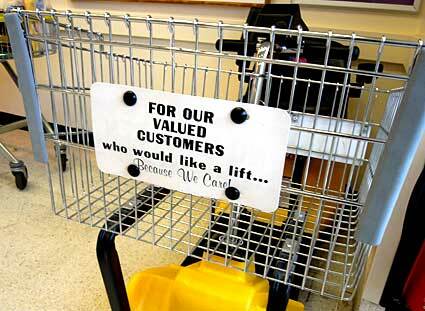 None more patronising customer wheelchair in Morrisons supermarket in Petts Wood. The supermarket used to serve as the Embassy Cinema. 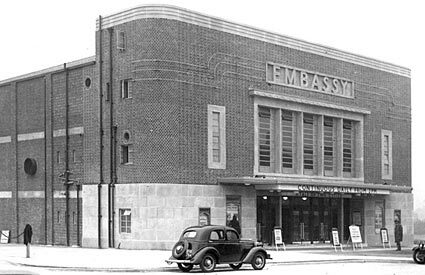 Opening in 1936, it boasted 1,350 seats until closure in 1973 was a focus for the local community. The Pet Shop of Petts Wood (try saying that after a few beers). Leaving the station, we headed north, passing this 1920s semi in Crest View Drive. 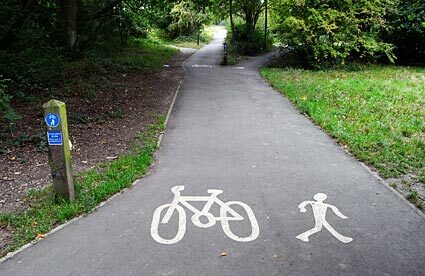 There were so many signs and paths here that we nearly got confused. 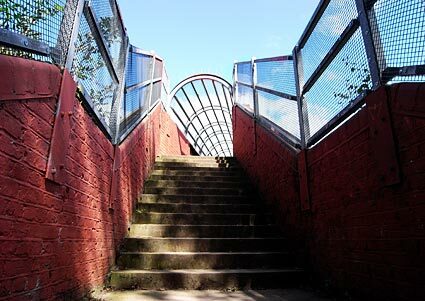 After a quick look at the map, we turned around and headed off north-east towards the railway footbridge. 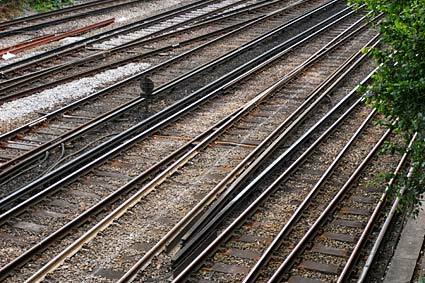 We first crossed these busy railway tracks on a large - and rather ugly - metal enclosed footbridge. 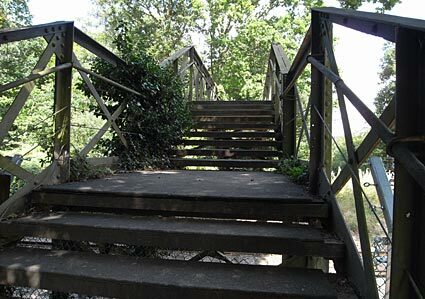 The second railway bridge was a rather antique-looking wood and metal affair, spanning a single track. The last bridge before we reached Petts Wood.